I need to say this up front: I really dislike re-creation/clone/tribute vehicles. I need to say this up front: I really dislike re-creation/clone/tribute vehicles. Yet as I paged through the catalog for Auctions America’s upcoming Fort Lauderdale sale, I was struck by the really amazing re-creations that will be offered at the sale. And then there’s the Tucker (but more on that in a moment). First, let’s consider the re-creations: A 1930 “Blue Train” Bentley, 1966 Porsche 906 VRC, 1931 Duesenberg Model SJ dual cowl phaeton, as well as a 1976 Porsche 911/935 Kremer K3 and a 1957 Mercedes-Benz 300SLR. “The ‘Blue Train’ is one of our featured lots,” said Auctions America car specialist Barney Ruprecht, who noted that the car was on display last weekend at Amelia Island and may have been the focus of more photographs than any other vehicle. “It captures everybody’s attention,” he said of the car inspired by the Gurney Nutting-bodied Bentley coupe made famous when Bentley chairman and two-time Le Mans winner Capt. Joel “Babe” Barnato wagered that he could drive his Bentley Speed Six from Cannes, France, to London before the famed Le Train Bleu could complete the same run. Truth was, Barnato and his co-driver didn’t do the run in the coupe but in a Muliner-bodied Bentley Speed Six because the coupe wasn’t completed when the race took place. 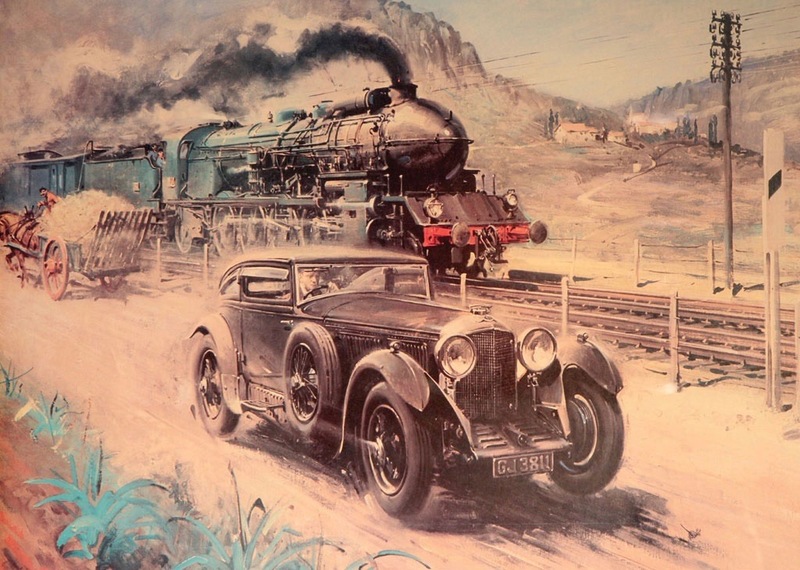 However, it was the coupe that was featured in Terence Cuneo’s painting of the race and thus became the famed “Blue Train” Bentley. Re-creations are produced by a British coachbuilder, which has a three- to five-year waiting list for such vehicles. Auctions America’s pre-sale estimate for this one is $600,000 to $650,000. The Porsche 906, or Carrera 6 as it is more commonly known, was the German automaker’s response to Ferrari’s new 206 Dino racing car. The re-creation — for vintage racing or street use — is done in Argentina by Vintage Racing Cars of Buenos Aires. The cars are built to carry any of the 911 horizontally opposed six-cylinder engines; the one being offered at Fort Lauderdale — which has competed in vintage races at Daytona and Sebring — has a 2.7-liter with racing pistons and Weber carburetors. The pre-auction estimate is $250,000 to $300,000. The Duesenberg re-creation ($160,000 to $190,000) is out of a European collection. It is built over a 1988 Ford F-250 heavy-duty truck frame (the wheelbase matches the original Duesenberg) and is powered by a 5.7-liter GM V8. The Kremer K3 ($40,000 to $50,000) is a period 911 fitted with fiberglass bodywork like the slant-nosed Le Mans-winning racing car. The 300SLR ($60,000 to $70,000) is one of a reported dozen built by Thoroughbred Coach Builders of Florida over a square-tube chassis. The body is fiberglass and the engine is a 302-cid Ford V8. Other featured cars among the 460 scheduled to cross the block April 1-3 at the 14th annual sale at the Broward County Convention Center include a 1967 Shelby GT500 Mustang, 1967 Sunbeam Tiger Mk II, 1971 Ferrari 365 GTB/4 Daytona, 1953 Chevrolet Corvette, 1960 Cadillac Eldorado Biarritz (with factory bucket seats), 1952 Mercedes-Benz 300S roadster, 1981 BMW M1 (a one-owner car), 2010 Spyker C8 Spyder and 1983 Ferrari 512 BBi. Also a 1971 Mercedes-Benz 280SE 3.5 cabriolet, 1965 Shelby GT350 fastback (with original K-code engine), 1966 Shelby GT350 fastback, 1958 Porsche 356A Speedster, 1970 Ferrari 356 GT 2+2, 1996 Porsche 911 Turbo coupe, 2014 BMW i8, 2006 Mercedes-Benz SRL McLaren, 1956 Cadillac Eldorado Biarritz convertible, 1994 Porsche 911 Turbo 3.6 coupe, 1999 Ferrari F355 Spider Serie Fiorano, 2005 Ford GT, 2001 BMW Z8 and 1935 Lincoln Model K V12 LeBaron-bodied roadster. A 1964 Ford Falcon Futura resto-mod will be sold to benefit the Boys & Girls Clubs of Broward County. And then there’s the Tucker, car No. 1052. Wait, you say. There were only 51 Tuckers. 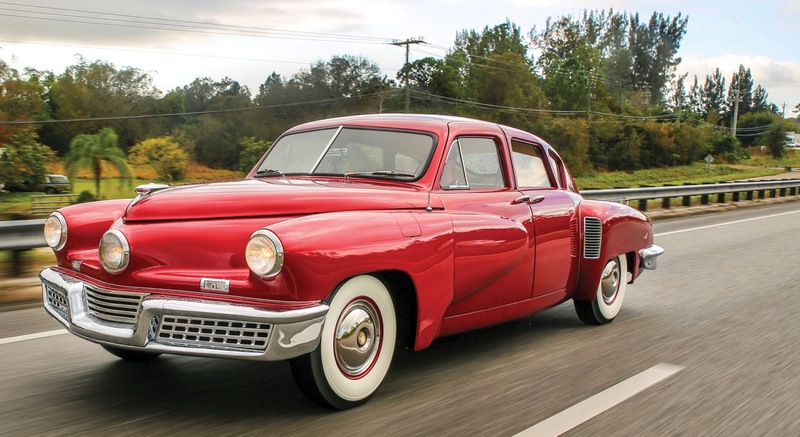 True, but when Tucker closed, the chassis, firewall and suspension of car 1052, which had been the test bed for the Tuckermatic automatic transmission, were awaiting final assembly. At the bankruptcy sale, 1052 was sold to Ezra Schlipf, as were the undamaged front-end sheet metal from 1018, bumpers, doors, quarterpanels, decklid, engine, transmission, etc. 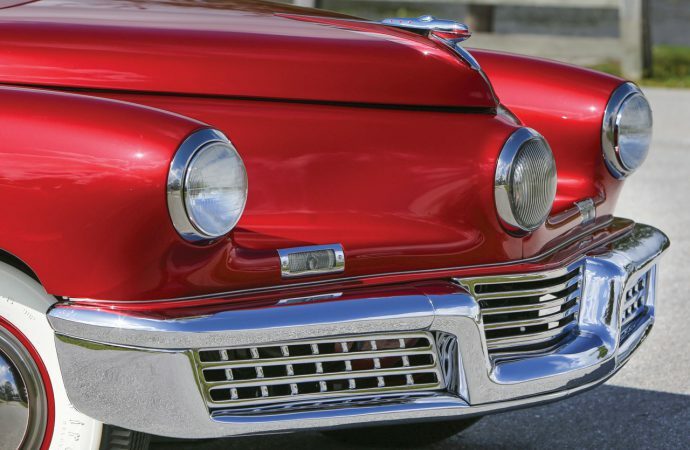 All of it went from Schlipf to other Tucker enthusiasts, including Tucker club co-founder Stan Gilliland and Michigan car collectors Richard and Linda Kughn. Eventually it all went to a museum in Illinois to be part of a re-creation of the Tucker assembly line. But when the museum needed money for expansion, it sold the yet-to-be-completed Tucker to the current owner, who had one Tucker expert authenticate every part and then sent everything for final assembly and restoration to Brian Joseph’s Classic & Exotic Service restoration shop in Michigan, which already had done a Tucker restoration for a museum. After being completed last year, the car won class honors in the Concours d’Elegance of America and was displayed at the Red Barns Spectacular at the Gilmore Car Museum. 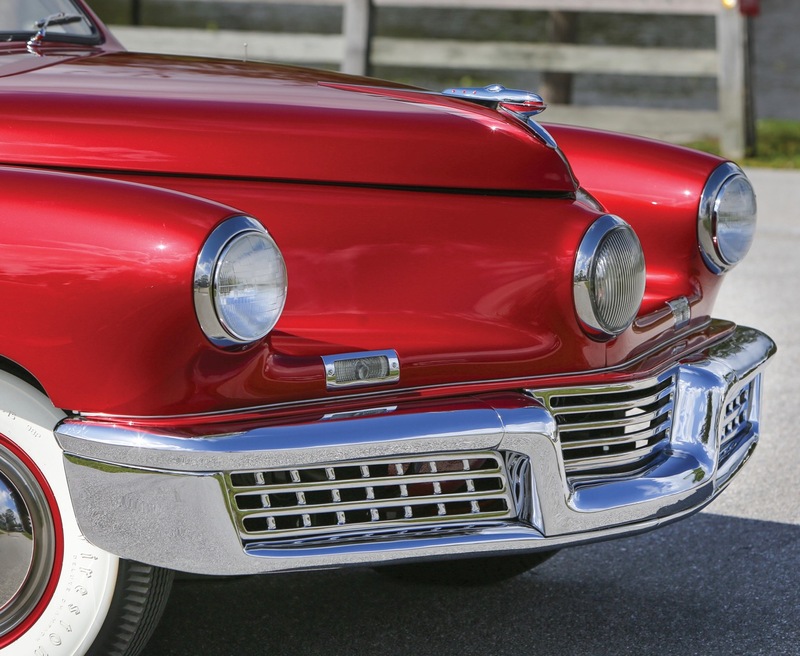 “It’s 100 percent legitimate, actually more legit than some of the (Tucker) cars that are out there,” said Jay Follis, former head of the Tucker club and the collections registrar and marketing manager of the Gilmore Car Museum. “Everything on it is done right,” said Follis, who followed the car’s progress at least since Gilliland’s ownership. Auctions America has set a $950,000 to $1.25 million pre-sale estimated value on the car.